Columbia University Nursing School. While at Columbia, the Japanese invaded China and her family managed to flea China for safety in the Philippines. Despite a bout of rheumatic fever Dorothy graduated in 1940 from Columbia University - Presbyterian Hospital School of Nursing. She then travelled to Manila, reunited with her parents and sister Eva, and began working at Steinberg General Hospital . Following the fall of Manila to the Imperial Japanese Army, Dorothy and her family were captured in December 1941.. The 48 acre University of Santo Tomas was turned into a heavily guarded internment camp for American and European civilians. It was here that she and her family were held prisoner. At the time, Dorothy was engaged to Lt. Don Childers, a Philippine Scout. He also was captured and perished when the Japanese ship he was being held captive on was torpedoed by the U.S. Navy. held in the main building, with 25-45 persons per classroom. Japanese in a prisoner exchange. Because of the severity of her illness they sent her mother along. Safely aboard the Swedish passenger ship “Gripsholm” and bound for medical care in New York, Dorothy held steadfast to the hope of her family being safely re-united. General McArthur wasn’t the only person who vowed that they would return. Mere months after her release and with gunfire hailing down, Dorothy …..now 2nd Lt U.S. Army Nurse Corps, returned as one of the liberators of the Santo Tomas POW camp. She was now reunited with her father and sister. During their imprisonment 456 civilians would die and another 4000 would have life long impairments. promoted to 1st Lieutenant. It was at this time that she met Lt. Jack Thompson. Within weeks they would be married. A marriage that would last 67 years, ending with Jacks death on April 6th of this year. later became part of the staff of the newly built Methodist Hospital. She retired as Director of Nurses at Methodist Hospital in 1982. Cross and the Military Affiliate Radio System (MARS). 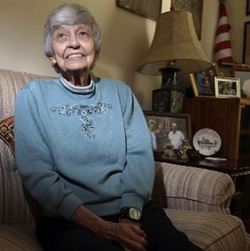 On September 2nd, 2013 Captain Dorothy Susie Davis Thompson-KF5XI United States Army Nurse Corps, Ex-Prisoner Of War, Hero of the United States and of the Philippines, healer of the sick, and Amateur Radio Operator passed away at the age of 95. She is survived by their children Jack H. Thompson Jr. (wife Jane), Marjorie S. Camp (husband Roger), and Peggy T. McCray (husband John) as well as numerous grand-children and great-grandchildren. Cemetery. Memorials may be made to St. Paul's Episcopal Church, 1018 E. Grayson St., San Antonio, TX, 78208 or to the charity of your choice.